Fairy tales are simply tales, told and re-told, but changed over time. It has been four months since Maggie learned the dark truth behind the tale of the Princess and the Pea and freed Princess Lindy from the cursed Emerald. Lindy is now back in the past where she belongs, queen of her tiny Scandinavian country, and Maggie is a fully reformed ex-stalker. Except … she can’t stop doing internet searches on Lindy and her country. One morning, Maggie wakes to find history turned on its head. Apparently, you can’t destroy a centuries-old curse without consequence. In order to prevent the changes in history from wiping out the present, Maggie resurrects her stalking gene and learns that fairy tales don’t stay dead for long. Or at all. Back in 1623, Lindy is juggling a threat to her family, a handsome new guard she’s not supposed to have feelings for, and a cursed Topaz with ties to the tale of Thumbelina. When past and present collide, Lindy and Maggie are brought together again, and another of Andersen’s tales turns from twisted fiction to chilling fact. 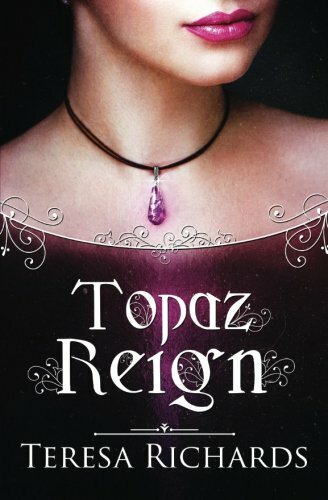 I enjoyed Emerald Bound, but I really, really liked Topaz Reign. This story drew me in from the beginning and kept me entertained throughout. I enjoyed how each of the characters grew and developed in this story. Lindy struggles to live life as the queen, and feels like she's messing everything up. She really misses Garon and wishes he was with her to offer her support. Maggie is trying to readjust to normal life with Garon at her side now, but she almost obsessively researches any information she can find about her friend in the past. When she notices that history has drastically changed, she and Garon know that something has gone wrong and they have to fix it. I enjoyed how the author wove the future and the past together and how she eventually brought Garon, Lindy and Maggie back together. There are some unexpected twists and turns in this story - things I never would have guessed at - which is a good thing, because you never quite know what's going to happen next. I'm not sure how I feel about the ending of the story though. I need to process that a bit more to decide if I like how it ended or not. Definitely a good, quick read that I will be adding to my bookshelf. Yes, this was a fun book to finish the series with. Right away I got pulled in, but I will say that I was a little disappointed when it kept changing points of view back to Maggie. I felt like she already had her story, and she could have still been in this story without the switches back and forth. I would have liked more between Lindy and her love interest. There was a little bit, but then towards the end it was all summed up and I feel like I missed out on some great characters falling in love, and their story on how they got there. The ending...hmm...not sure about the ending. I can't say much without it being a spoiler, but even though I had no problems with the time travel, magic diamonds, scifi stuff in general I did struggle with the end for Maggie. I know that doesn't make sense, but I don't want to ruin it for anyone who has yet to read it. And read it you should, because it's a fun, quick, YA read.